I was reminded of this pyaz badiyon wali subzi when I was flipping through the pages of Vikas Khanna's book called Hymns from the Soil. There is a similar onion soup in the book that uses ginger and cumin for the base flavours, the simplicity of the onion soup and the way it looks brought my childhood back. This pyaz badiyon wali subzi was made during the hottest time in summers. Back then I did not realise but it was for a purpose, it was light to digest and tickled the taste buds that were overwhelmed with more and more mangoes. This curry was actually had like a soup (in large amounts) but along with whole wheat thin chapatis. Badiyan (singular-badi) are sun dried lentil cakes made using urad daal (skinned black lentils) paste mixed with spices and grated ash gourd or chopped coriander greens. The aroma of these badiyan is really interesting as this is one of those umami flavours in Indian cuisine. These badiyan are shallow fried in mustard oil and added to curries to add flavours. 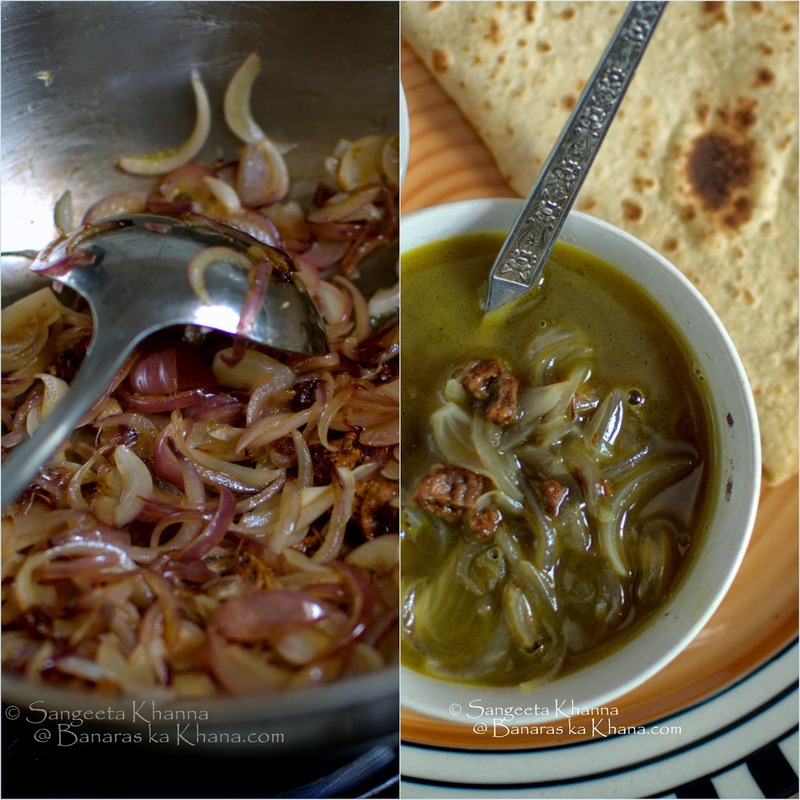 In this case it is just sliced red onions and the badiyan made it really special. The recipe is simple, but need precision as the specific taste has to be recreated. Onions are caramelised along with crushed badiyan and then the mix is cooked with loads of water. 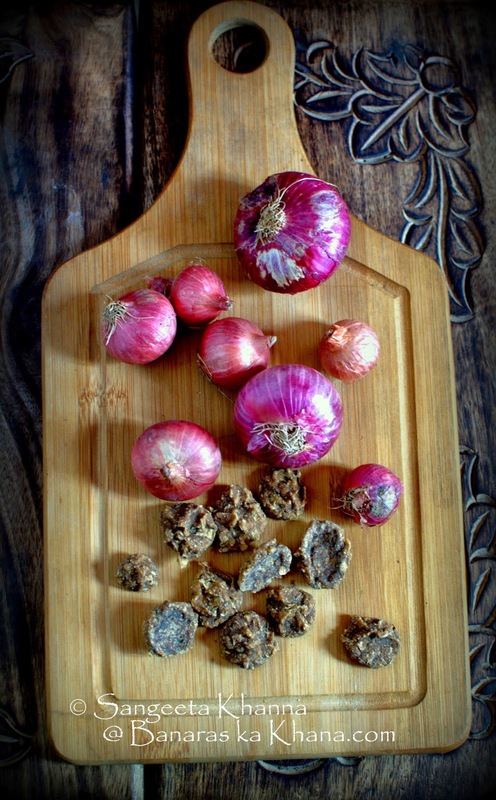 No spice or even turmeric is added and flavours come from the onions and the spices sun dried along with the badiyan. I shall try and make these badiyan and post a recipe soon. Heat the mustard oil and tip in the cumin seeds. Add the red chilly, the broken badiyan and sliced onions one after the other. Fry the onions to caramelise them slowly and the badiyan also get nicely roasted along. Add salt and about 3 cups of water and let the curry cook on low flame for 15 minutes or a little more. 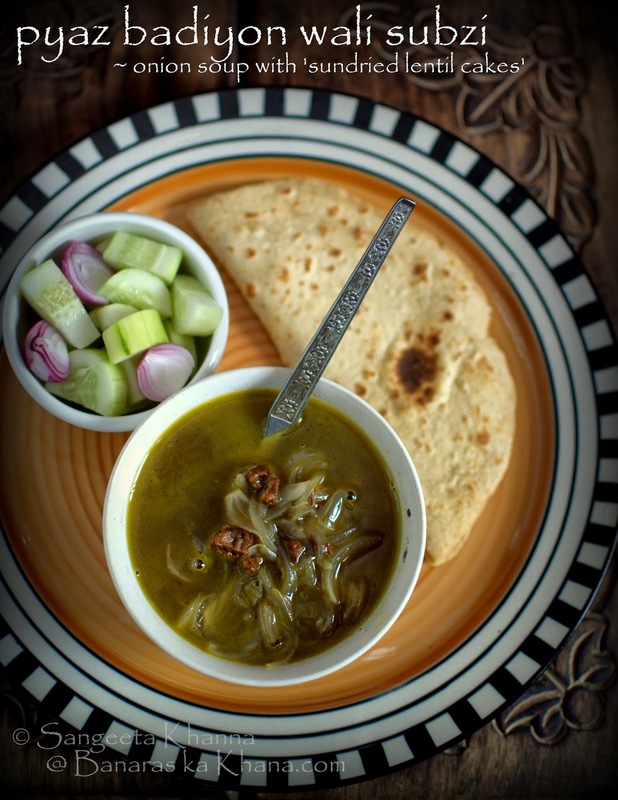 Adjust consistency as desired and serve hot with thin chapatis and may be a sookhi mung daal. It makes the most divine meals in summer time. 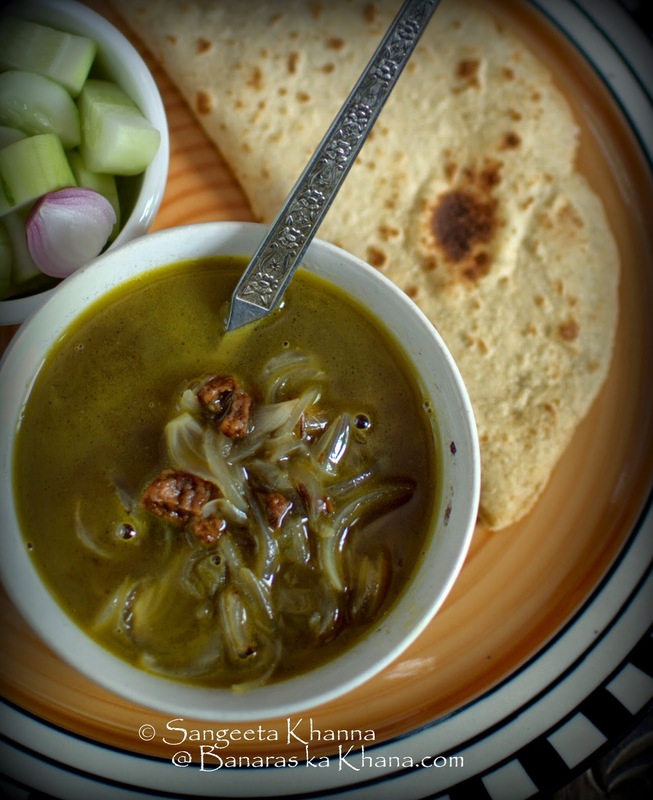 I had it with besan wali roti and some raw salad on the side and was a content soul after having a hot meal that revived memories of my grandmother. It will do the same to you if you belong to eastern UP or you parents have lived there. Such foods make their way into your home even if you have lived there just for a while.